When I looked at this it instantly took me back to my teens. I actually remember buying these when I was a teen! We were astonished (and also terrified…clearly, we need to be cleaning out cabinets more often!). 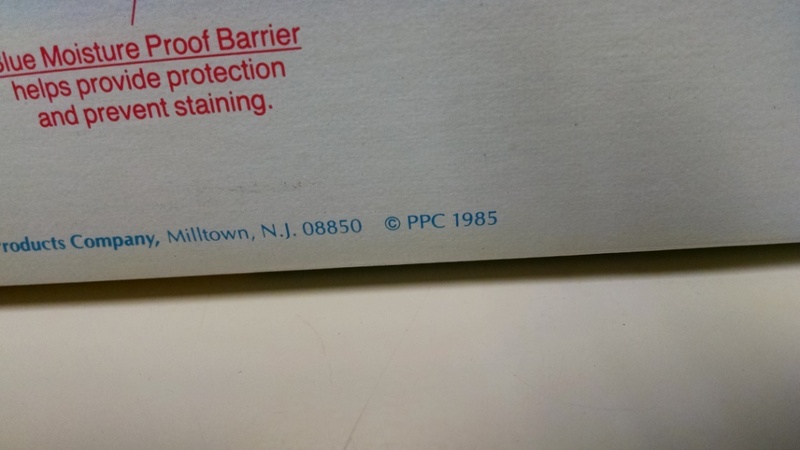 The copyright on the box says “1985,” although web research indicates that this style of box was in use as early as 1978 (and possibly earlier). We all cracked up when we saw the $2.39 price tag – that alone tells you it’s old (I think now this particular brand is up around $6 or $7 if you don’t get it on sale, at least where I live). Ahh, the days when pad marketing revolved around women in flimsy dresses galavanting just about everywhere…however, in the early 1980s, we were only a few years out of belts(read a whole history here: http://www.femmeinternational.org/the-blog/the-history-of-the-sanitary-pad). 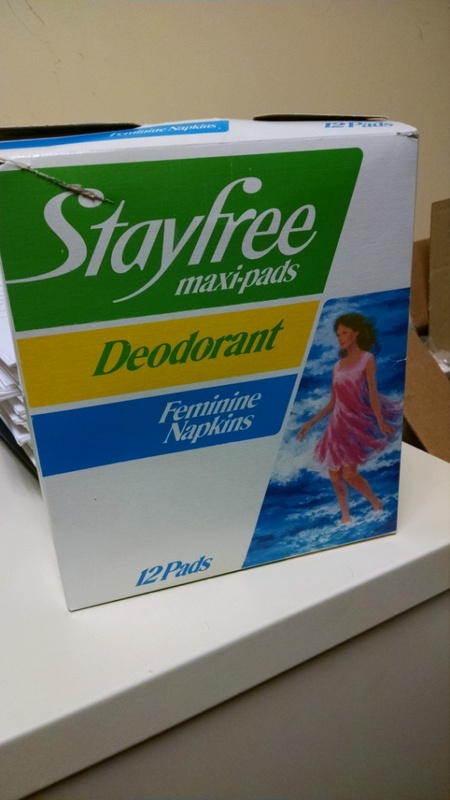 And to answer before you ask: yes, there are still pads inside. Unwrapped, because that was before the days of wrapping them (yuk). Someone suggested I try to sell the box on Ebay…I think not. 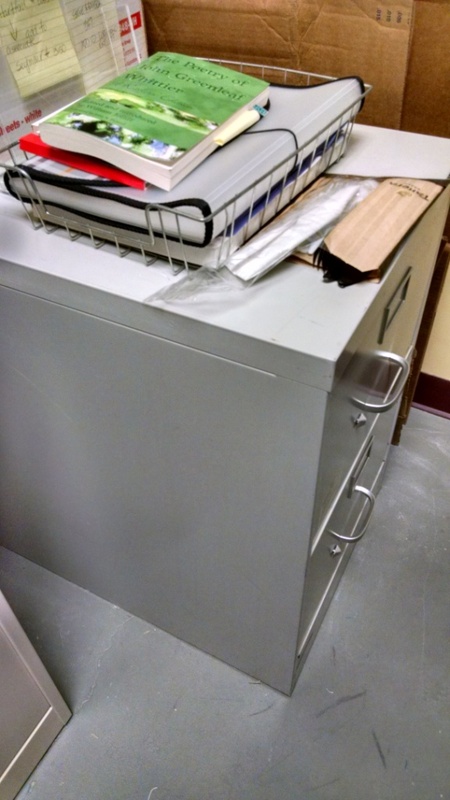 This filing cabinet, I found out, has actually been through several moves as the business’ location has changed throughout the years. 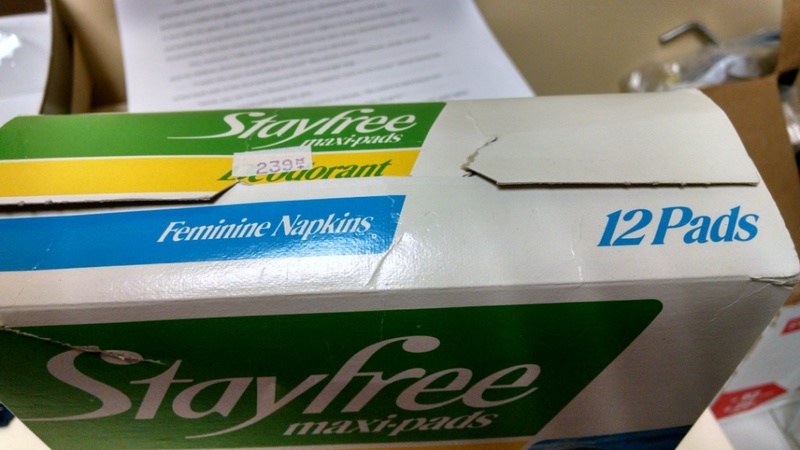 “The History of the Sanitary Pad,” Femme International, June 24, 2013, http://www.femmeinternational.org/the-blog/the-history-of-the-sanitary-pad (accessed July 12, 2016). 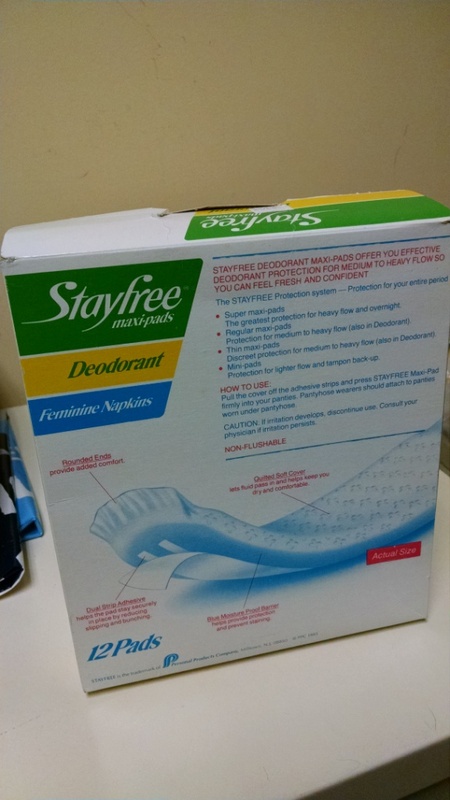 Posted on August 1, 2016, in Deep Thoughts & Fun Stuff and tagged history of the sanitary pad, old things found in cabinets, Stayfree Maxi Pads 1980s. Bookmark the permalink. Leave a comment.